On Day two (April 5th, 2014) of the Fest-Of-Ale in Penticton the party started at Noon. Seeing as I was one of the Judges for the Fest-Of-Ale Awards I was not able to join the party until 3pm. From the Judging room it sounded like there was a tone of fun being had though. There was also more great music on day two including Flashback, Joe’s Garage, Papa Wheeley, The Dungbeatles and Thursday Night Jazz Band. Day one of the Festival was a bit more business for me as I knew that I had friends that would be at day 2. While spending time with a few groups of friends I noticed that day two was quite a bit busier that the first day. People seemed to be imbibing in a little more alcohol but everyone was having a great time! I enjoyed a wide selection of beer although I did not need anymore really after all the judging. It was then time to announce the winners to the entire room. Not only did they announce the beers that won the Judging portion of the competition but they also announced the people’s choice awards. The winners of the Fest-Of-Ale are as follows! The festival went on until 6pm and was a blast! Once again I did take it easy at the actual event as I had one more event to hit up after this Festival. I have to say that this is a very well run Beer Festival. it is more about learning more about craft beer and different flavours than it is about over indulging. It is great to see that this event has matured in the last 3 or 4 years from what I hear was a bit of a drunk fest. It is amazing what removing a few vendors can do to change the whole feeling of a festival. 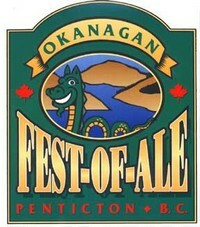 Congratulations to the organizers of the Fest-Of-Ale for pulling off a wonderful 19th Annual Event. This entry was posted in Tasting Event and tagged after party, alpine brewing company, bad tatoo brewing, barley mill brew pub, beer, big rock brewery, bomber brewing, bravo beer co, brewers, brewers reception, brewery, brewmasters, cannery brewing, crannog ales, Creemore Springs, dead frog brewery, Deep Cove Brewers and Distillers, dogleg marketing, driftwood brewery, fernie brewing co, fest-of-ale, firehall brewery, Four Winds Brewing Company, granville island brewing, hoyne brewing, hoyne brewing co, lighthouse brewing company, mcclelland premium improts, mill st. brewery, mt begbie brewing, Nelson brewing company, okanagan, orchard hill cidery, parallel 49 brewing, party, penticton, phillips brewing co, red truck beer company, summerland heritage cider company, tin whistle brewery, tree brewing co, vancouver island brewery, wards cider, whistler brewing company. Thanks for the links Mike! Looks like another great year in Penticton! no problem. I wanted to have links to reviews to as many winners as possible.